When the first letter arrived Carl was able to conceal it from Margie. It was that second letter he was unable to halt. The brown envelope was addressed to Carl. On the back a huge lipstick kiss in bright fuchsia startled Margie. She managed to leave it sealed for an hour before she lost her resolve to wait for Carl to return from golfing with his pals. The page shook in Margie’s hands though her knuckles went white from gripping it so hard. When Carl arrived home he didn’t seem surprised. Life, he thought, no parole. Margie breathed a sigh of relief; she and Carl were finally on their dream t vacation. 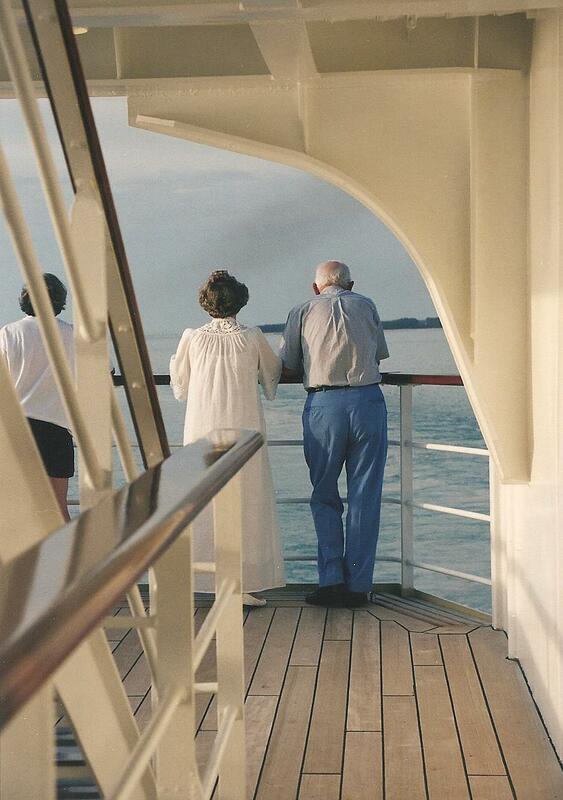 She had always wanted to go on a cruise; but Carl was always too consumed with work . Little did she know that a nightmare from an old case would be onboard. Carl was lounging by the pool deciding whether to take another dip, or go to the noon buffet. Margie had gone to an aerobics class; so his time was his own. All of a sudden Carl sat straight up, staring at one of the stewards passing out drinks to the pool side vacationers. Could it be; or was his overactive imagination in full gear. Carl always had a certain case in the back of his mind. The case he never brought to justice. Back when he was on the force he came very close to putting away a vicious criminal. One who had broken and entered a home; but not content with just robbing the place, he also terrorized the family. They had caught the guy; but between an error with the DNA and a slick lawyer; he got away with it. Carl vowed some day, he would find a way to put him away; or take justice in his own hands. Carl made up his mind. He slowly got up, approached the steward acting like an ailing senior citizen and asked for assistance back to his stateroom. Of course the steward complied. Little did he know who he was helping, nor did he know that Carl had notice an out of the way corner on his stateroom floor away from prying eyes. Carl knew it though and finally found the justice he had looked for. After he left her by the railing, she let out a giant sigh of relief, thirty two years of living with Carl was finally over. Earlier today, she did just that to Carl. Now it was over and as she leaned on the railing, she opened his Glycerin pill bottle and one by one, enjoyably, popped each and every tiny mint candy into her mouth. The Mad Dog Biker Club had a large presence through Carl’s old stomping grounds. The club didn’t let bygones be bygones. Ever since Carl successfully prosecuted a club leader he’d been on their hit list. “Do you think they’re on board?” Margie followed Carl down the passageway. Once off the ship, they retreated into a seedy bar nearby to hold up until the gang of bikers discovered they were no longer on board and leave the vicinity. An hour later the rumble of motorcycles drove by the bar. From inside Carl looked through a dirty window. He recognized the colors the bikers wore and let out a sigh of relief. “Now what do we do?” Margie asked, discouraged about missing their dream cruise. Margie put her trust in Carl and found herself on the back of a big motorcycle wearing leathers and sunglasses. Margie wrapped her arms around her husband and hung on for the ride. “Go play some shuffleboard, Benny,” Carl said. He shoved the pistol in his pocket and led Margie away from the man at the rail. “You didn’t like the meal?” Carl asked his wife. Carl gripped the handrail and studied the magenta sky. A Coast Guard cutter approached to starboard. Her pilot wore a Customs jacket covering his sidearm. Three officers boarded the cruise liner. “Carl, Margie! Over here!” Carl recognized the familiar voice from across the Lido deck. He wanted to ignore it but Margie heard their names being called. “Hello Barbie, hello Ken. What a surprise! I didn’t know you were booked on this cruise.” Margie was sincerely happy to see their neighbors. She pulled Carl by the hand to meet the other couple lounging next to the pool. Carl reluctantly followed and wished they had gotten off in Mazatlán this morning. He had no desire to spend time with the couple. Ken was a slime ball and Barbie hadn’t given up her habit of pinching his backside every chance she got. After a third rum punch, Carl could laugh at Ken’s crude jokes and ignore Barbie’s flirtatious looks. A quartet played lively fiesta music while the foursome danced amongst the other vacationers. Carl felt a bump he assumed was just another traveler who’d had too much rum. To his surprise, he recognized the individual as an adversary from his past. Looking down at his shirt; blood stained it a scarlet red from the fresh knife wound. Margie screamed, and the assailant tried to flee only to be tackled by Ken and beaten by Barbie as she leapt onto his back, pelting him with her mighty fists. Moments later the attacker was led away in handcuffs by ship security. Relieved and grateful, Carl was never so glad to have neighbors the likes of comb-over Ken and the bleached blond Barbie. “Finally.” Margie let out a contented sigh. Margie smiled until the view of her husband was blocked by a large man wearing black. It was such a shocking contrast to their light, airy tones. “Did you think I’d forgotten?” the man asked. He smelled of hard liquor and long nights. He leaned slightly forward to make eye contact with her. “It’s okay, my love.” With that one glance, it seemed as if their souls touched. Just as Carl stepped aside, ready to go to his death, he heard Joey grunt. As if in slow motion, the towering goon lurched forward, over the railing, and into the ocean. “But … how?” Carl asked. Carl and Margie had been married for thirty-five years. She had stood by him through the toughest times of his life. Yet, as the years crawled by, Carl’s passion for his work superseded his love for her. Sleepless nights, unexpected heartbreak and endless disappointment cemented the hatred that now encased her heart. The cruise had been his idea. Her avoidance of the topic propelled him to plan each minute detail on his own. While boarding the cruise, Carl had wandered off on his own, leaving her alone and dejected, once again. That precise moment ushered in a new-found wisdom and a remedy that would take away all the pain. Margie walked towards the ship’s railing and took her rightful place next to Carl. He was oblivious of her presence and continued to stare at the open blue sea. A simple accident could change the course of destiny. A careless fall would douse a grudge that had been smoldering for years. The lovebirds sat staring into each other’s eyes. Soft laughter filled the air around them. Fingers entwined as the flickering candlelight danced upon their faces. Margie sat absolutely still, her gaze fixated upon the table directly in front of her. The love-struck couple seemed to be truly in love. A tap on her shoulder made her turn. The grey haired stranger from the previous evening stood grinning with a bouquet of red roses. Carl lay alone in their cabin. Two plastered legs would do for now. Next Next post: Print Book Time!